A common issue in modern cities is traffic congestion and air pollution caused by big trucks to deliver supplies to shops and other businesses. For orbital space settlements we propose to replace this “traditional” method of cargo delivery with something else. British engineer Noel Hodson has proposed the use of underground pneumatic tubes, which he calls FoodTubes, to transport small containers. Because these tubes are completely separated from other transport infrastructure, this method of transporting goods does not conflict with other traffic. As shown in the video below movable containers could be placed on (electric) bikes and can be used to deliver goods to customers. Both transport systems can be combined. Pneumatic tubes can be used to transport goods to local distribution centers, from there the cargo bikes will be used to deliver those around the neighbourhood. 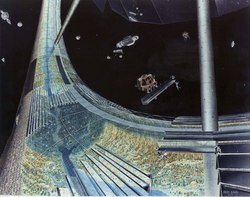 In an orbital space settlement we can build those tubes into the outer-wall of the habitat. Each free space habitat has a wall, where tubes and the like could be hid away (source: NASA).